Craig Pullen: Okay. 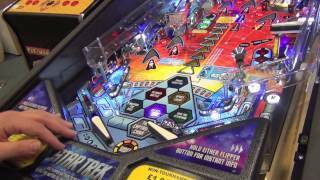 So I'm going to just quickly talk you through on how I would play Star Trek. Now, Star Trek is a very new game. There's been different versions coming out all the time. I'm not sure if this is the latest version or not, but I will just talk you through on a few simple things that I'm going to be doing in terms of how I'm going to play the game. So, as we start off, you are in control of this grid. So if you flip the flipper, you can choose which one you want to play. So these are little modes. 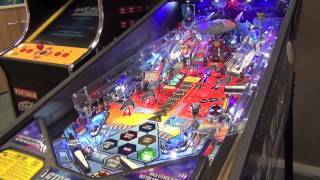 Now I don't, like I said, because it's such a new game, I don't know which ones are the ones where the most points are, but my objective is basically to get through all of the modes, because I know at the end of this, after doing all six of these modes, there's a special multiball at the end. So I'm going to try to get to that point. Whilst I'm on the way to doing that, actually, let's just talk about how we move from each mode. So let's say I choose prime directive as my first mode, the way to do that is by pressing this button. And then the ball would fire. That would lock in this mode, and then what will happen is there will be a 30 second timer whilst you're playing out mode, and you have to make a series of shots, and you're playing out that mode. At the end of that mode, then what will happen is either this shot here, the mission start shot here, or the away team shot here will light. And that's the way that you then move onto the next mode. So I will be, at the end of prime directive, I will be aiming for either of those shots in order to then move onto the space jump. So that's why that shot there, like you saw earlier, is such a crucial shot, and this shot here underneath the flipper. If you can nail those shots, get really accurate with those shots, then you've got a chance of doing really well. The other things that I'm going to be concentrating on are these targets here, one, two, three. Those three targets there are like your lock. So as you saw, I hit the one, two, three, and then this lock here, this green lock here, lit and this lock here lit. So then what you're doing then, you're trying to get the ball either there or there, and either there or there. And then that will lock the ball. 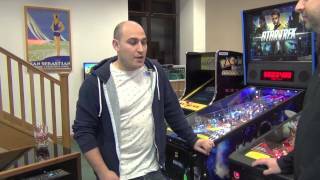 So then it will say, 'Ball 1 locked', and then your objective is to do that three times in order to get the multiball. So if I hit those targets again, one, two, three. Then I would light the next lock. 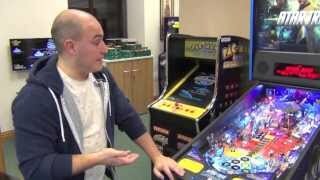 So I want to do that three times in order to get a multiball. So I'll do a bit of that. And then the other shot I'll be needing is this middle shot here. 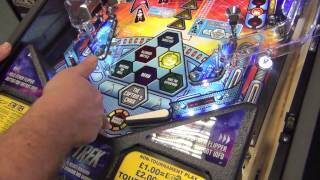 So that target will come up, and if I hit that about five times, I think it is, on this version, then there's another multiball there. So I'l be doing all those things . Now, one thing to say, one thing to say is those two, these targets are very dangerous, in terms of an objective. Hitting these targets means that once you hit them, the ball is wild and is all around the playing field. So I will hit it with this flipper, at points, but my main objective, if you like, is just to try and get these modes. And then I would try and get multiballs linked in with the modes when I can. Again, hitting this sensor target is also a very risky play, because once you hit it the ball is wild and you're a lot less in control. So, those things, I will play them, but they're not my main objective. So, let's try and give it a go and see how we get on. And I'll probably fail, but we'll see how we get on. Okay. So we're just going to play out a game of Star Trek now. Just watch out for all the skills that I kind of talked through before. And we'll see if we can finish this whole mode area here. Okay, so what I did from there, instead of actually shooting the walk ramp, I deliberately shot for this area here, because once the ball was on, I decided actually that decision was probably better. All of those purple arrows were what I was aiming for, and that's the end of Nero. So now I'm going to try and shoot either this mission start shot here, or the away team shot. It's off the left flipper. Lift that right flipper up, and then make that shot. Okay. So now I'm going to move down to Destroy the Drill. On Star Trek, what we want to try and do is we want to try and get three in row, because that awards us something extra. So I'm going to start the destroy the drill next, and then after that I'll start Save the Enterprise. So as the ball comes out of the bottom, I'm not going to shoot, I'm going to, yeah, that was a bit of a bodged live catch. But again, I'm going to play the same way, made the live catch, and then I've got the ball under control. I'll make either of these shots here, or that ramp. Okay, I missed the shot. You have to be quite aggressive sometimes, in terms of getting the ball away from those out lanes to get the ball out. Now the lock's lit. So I'll try and shoot up the middle. Okay, nice shot. So that's my first lock. So as the ball comes out, I'll either drop catch, or I'll dead bounce. So a dead bounce, and then there we've got the ball under control, made the shot. So now I'll go back to the spinner. Okay. Okay, a bit of progress, but not the best first ball. Let's see how we do on this one. So now, so Destroy the Drill is done, Nero is done, so now we're going to start Save the Enterprise. So again, I want to try and hit those targets whilst ball save is on, because it's a dangerous shot. Okay, that was lucky. Might actually get the lock, out of the lock and then try and live catch if I can. Okay, busted it. Okay. 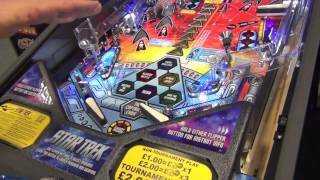 So now, now I've got one target left up here in order to get the multiball, but I'm going to just work my way through the modes, get past there, back up the top. It's very nice to do this sometimes when that mode is lit. Okay, so I'm on the machine, working the machine, getting the ball back under control. Now straight into the away team if I can. Now we're going back over to mission start. Just busted it slightly. Get the ball back under control. Right. So from here, this shot is actually harder than that one. So sometimes you might want to post transfer across, and then make the shot. I can actually have a go at it, just try and hit that shot. And that's the reason you don't do it, because it goes, the ball goes out of control. So let's try and make the away team shot. Missed it. Get the ball back under control. Make the shot. There we go. So now we're going to work our way up. So let's start Klingon Battle. Back under control. Made the shot. Good. There's your replay. Okay. Okay, back under control. So let's back on the spinner. Back under control. Back on the spinner if we can. There we go. Made the shot. That was nice. Back under control. Okay. So I'm just working my way through the mode. Making these red shots as much as I can. I've moved on from Klingon Battle. So now what we want to try and do is hit that last target if I can. Okay, I've got the last target, so the lock is lit for multiball. 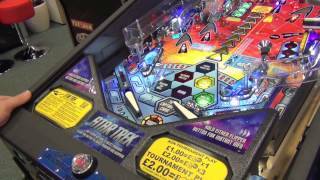 But before I start multiball, what I'm going to try and do, ahhh. It started multiball. So what I would have like to have done is to bring a mode in with that, because then you're scoring double points. Okay, let's try and do a nice multiball here. So each of those flashing red shots are the jackpot shots. 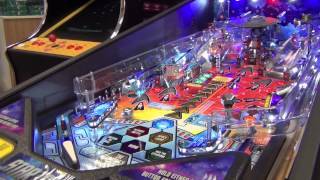 The thing is, at the beginning of a multiball, you can let all the balls drain, because you've got a shoot again lit right on there. Obviously it's not wise to do that, you want to maximize that. But you have got the ability to do that. So the ball's under control. Nice, like I was saying earlier, get those balls under control. Right. This is your prime situation, because now what we're doing is you've got two balls there. You've got two insurance balls that you're not playing with, and you can just play all day with the other one. Okay, I've got one trying to come out, I lost one in the process. But again, what we're going to do now is just going to play with the one. Trying to pick off all the shots that are lit if we can, while still keeping that other one trapped up. Okay. So that right ramp. Out the middle. Boom. Okay, that was not the best multiball. Okay, anyway. Now we go back to our missions. 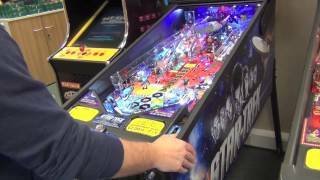 So we played our first multiball out, 3.2 million, not the best score. We'll go back to our missions. Again, you can see, this is a dangerous shot. But it's important. Right, okay. We're going to go in, there we go. So, you know, obviously, we couldn't do that in a competition, but for the demonstration of this video, it's worth doing. There we go. So now if we choose Prime Directive, then we've got another three in a row, it's going to roll in extra points. So that's worth doing, as well. Lovely live catch out of that shot there. That was about the best live catch I've done today. Bounce pass. Get the ball back under control. It's always what we're looking for. Let's try and make your shots, but get the ball under control. Live catch. Not too bad. 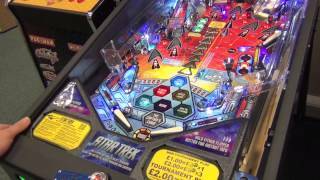 If we get out the middle now, we'll start Vengeance which is another multiball. So this is when you normally feel a little more pressure. You've just got to think, no, no pressure. Just make the shot. But obviously, of course, a little bit out of control. Let's make the shot. Up the middle. And then we start another multiball. 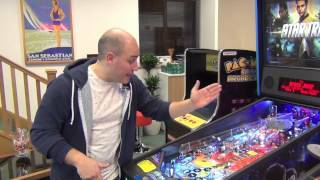 So, you know, although it's harder in multiball to control the balls, the fact that you've got that insurance is so valuable. 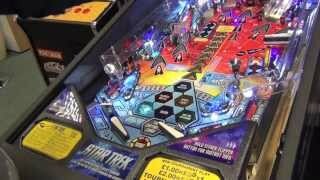 If you could always play in multiball, then you would, because then there's less chance you're going to die. So now what I want to try and do, so what I did there is I pressed Punch It, which was this button in the middle, and what it did is it awarded me an extra shot. So that's why I added that third ball. I'm not sure whether that was in terms of strategy or whether that's the right thing to do, but personally, I'd rather play with three than two, because it offers me that second option. So there we go. That was a nice little cradle separation there. It was a natural cradle separation, I didn't have to do much work for it. But again, trying to get those balls back under control. Make the shots. Balls out control, let's get the balls back under control. So I think we make a black hole shot, maybe it'll be added ball, or not. I'm not entirely sure. I know in one mode it is. There we go, yeah. So it's added ball. So that was definitely worth doing. You get a small ball, same kind, to play with. Again, try and get the ball back under control. This is the ideal situation. So this is called the Elwin pose. named after Keith Elwin, the best pinball player in the world. Two balls on the left and one ball on the right. That's your prime situation, because from there you can make four different plays. Back under control. So now, I've actually completed this Vengeance mode, the Vengeance multiball, and I'm on victory laps, which are worth 300,000 a shot. So now I'm just going to keep playing these shots out until I lose another ball, and then I'll be able to go back to my modes. But 300,000 a shot is decent money, so it's worth doing. I lost that one out the side. 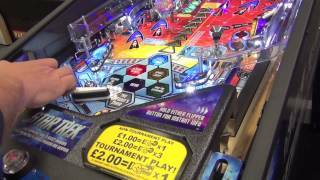 And what quite often happens is at the end of a multiball, because you've been playing with more than one ball for so long, you quite often lose that next ball. Don't think about it. Just go back to your strategy, go back into that frame of mind where you're just playing with one ball again. Okay. I shouldn't really do that. It's a dangerous shot, and it's not really worth many points, but it's so satisfying to shoot that I'm sure that they're going to change the rules eventually to make that a really lucrative shot. Onto the final mode now, which is Space Jump. So I'm nearing that final mode. There we go. Make the shots. Get up there, nice, let it bounce, nice, to that yellow, the spinner shot is the one. There we go. Nice. Okay. Lock's lit again over on that left shot, so we'll take that if we can. Okay, go back up the ramps. I don't think I've got it. Only had one danger there, and so I had to do that a bit more gently, but I got away with it. Okay, so, this is the final mode. So because I've completed all the missions, you get two more multiball, but you've got to continue to shoot the ramp shots, and they're worth a series of points. I think actually in the later version of software is a different mode. But we'll play it out and see if we can, ball save is still on, so I'm okay. Get that one back. And it says on the display, seven, so it go, so that's six, five, four, three. Ah. That was silly. My bonus is probably decent, then, so I probably shouldn't have done that. Okay. So we've done it through once. So we managed to make our way through all of these modes. Now what there is, as it says on the display there, Save the Enterprise two, so there's a second mode. So it's kind of like this, there's actually three modes per one. So this is Save the Enterprise two, Space Jump two, Prime Directive two, and there's Prime Directive three, Space Jump three, Save the Enterprise three. So in order to actually complete the game, once the software is installed, you've got to complete 18 modes, which is really, really deep. And so that's why it's so good in the home, because realistically, you're never going to be able to do that in competition or in a pub. It's one of those things that it's going to take a long time to achieve. So we'll go back through the missions. We'll try and play a few more multiballs. And we'll try and play out a few more modes. Nice. That's nice. Nice little combo, both locks there. So now I just need to relight the lock by hitting those green targets on the left. So there two more targets there. A good way of doing that is by shooting the spinner. If you get a nice shot on the spinner, if you just hold this right flipper up, sometimes the ball will careen into those targets. So we'll try that. Okay, not clean. Not clean again. Try the backhand. Okay. I didn't make it hard enough because it was a backhand, but we can still take a potshot. There we go. So I picked up one. Got one more target to get. So then now what we can do is I've got, on this button here, I think if I press that one it may spot that target for me, if I'm right. Maybe not. No. So that just awarded me a Vengeance shot. So I've still got to make that target shot. So we tried to shoot the spinner. No. There it is. Okay. So the final lock, the most important lock is on the left. And that's the end of the game. A bit of a disappointment at the end, but got to put my initials in. And at least you got to see the end mode for the first section. That's Star Trek. Cool game. Really, really nice game design by Steve Richie. Hell of a designer. Go out and play it. Cool. 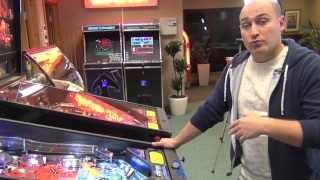 Andy: Okay, so for more pinball videos from Craig Pullen, please visit www.homeleisure.com/pinball.